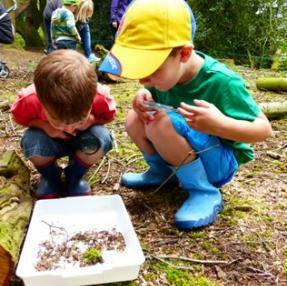 Nature Tots is our toddler group aimed at encouraging pre-school children, aged 2-4, to gain a love for nature and wildlife.Our Nature Tots sessions are held outdoors and encourage young children to explore the natural environment. We do lots of different activities; we hunt for mini-beasts, play games, we search for twigs, leaves, seeds and make natural crafts to take home, we tell stories and have lots of fun exploring. There is no indoor area so please dress to keep warm and get muddy! Booking in advance is essential for the 4 week programme. We only take bookings for children. All children need to be accompanied by an adult with one adult accompanying no more than 3 children. There is a maximum capacity of 15 children per session. We cannot exceed that.